That frequency and voltage are held within statutory limits. System Security would be reliably addressed as part of a Total System Analysis. Since estimates of future levels for load and generation are used, there is always a degree of uncertainty involved – the future demand may be much greater (or less) than the forecast, and the generation capacity may, because of breakdowns, be less than forecast. Therefore, there is always a small probability, no matter how much plant is planned to be commissioned, that there will be insufficient generating plant to meet the load on the day. So, there is a need to set a standard of risk of this situation occurring that would be acceptable to customers. Prior to privatisation, new generation was planned to be commissioned such that the risk was that in no more than 4 winters in 100 years would there be an event where there was insufficient generating plant to meet peak demand. System Planners would look ahead for the time required to build new generating plant (6 to 8 years) and make estimates of the most probable values of load and generation; and also the probability of the actual outcomes being higher or lower than these values. From this, a probability of failure could be calculated to assess whether the set standard of risk was being exceeded. When the system was privatised in 1990, the central planning arrangement and the set standard of risk described above were abandoned. Probability calculations, similar to those above, were done for each half hour and payments made to generators that were available based on the value of load that would have been lost if a shortfall had occurred. This was deemed to be sufficient incentive to encourage generating companies to build new plant. GB had moved from a set standard of risk to a cost/benefit arrangement. The New Electricity Trading Arrangements (NETA) which followed in 2002 had no incentive for generating companies to build more plant than was required to meet their contracts with Suppliers who sold to customers. There was no incentive for generating companies to build capacity to meet peak system demands with a margin of safety to limit the risk of system load being greater than forecast and/or generating capacity being less than forecast. The current arrangement, BETTA, which replaced NETA, is similar. There is now concern that the decommissioning of some fossil fuelled generating plant required under an EU directive within the next few years will increase risk to an unacceptable level. To mitigate this risk the Department of Energy and Climate Change (DECC) is proposing an arrangement of Capacity Payments through an auction process to encourage the building of generating plant to meet an enduring standard of risk set by Government. The prime fuels are coal, gas and nuclear. There are important differences between the relatively high level of confidence in the security of coal supplies (abundant globally, fuel readily stored, prices relatively low and stable) and the lower security of gas supplies (declining UK national resource, limited storage, some of the sources of imports may be risky, and increasing competition for LNG resources from Asia). However the introduction of unconventional gas sources may change this situation. Confidence in the security of nuclear fuel is high. Unlike the Standard of Security of Supply (generation), at the time of privatisation the Standard of Security of the Transmission System and the standards for voltage and frequency were carried over seamlessly into the privatisation arrangements. These standards had been in effect for several decades and gave an acceptable outcome to customers in achieving a balance between reliability and cost. The intermittency of wind energy input is a major issue in the development of policy. In this section we illustrate the effect of this on Security of Supply. 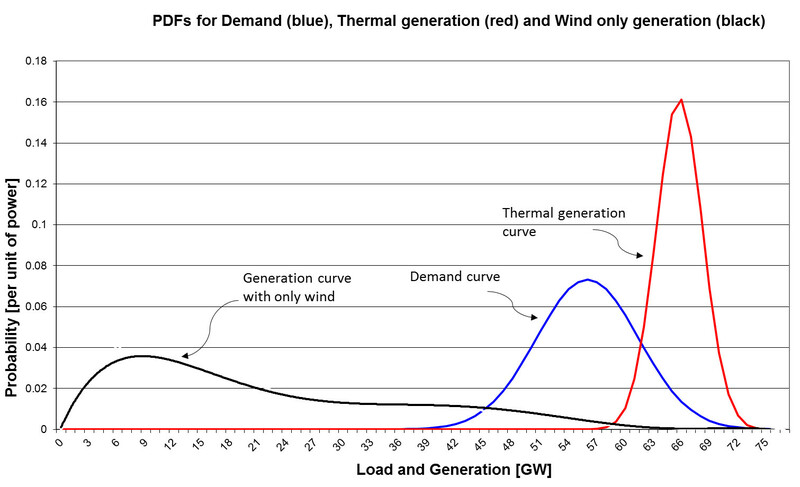 Figure 2 shows typical probability curves for peak demand – the blue curve - and for generation - the red curve. These are probability density functions but it is not necessary to have a full grasp of what they mean in order to understand what they tell us about the effect of wind on the system. The demand and the generation curves should be spaced apart with the generation curve to the right of the diagram. There should only be a limited amount of overap of the demand and generation curves. The black curve in Figure 2 has the shape of a typical probability curve for wind generation (i.e. it has the highest value of the function towards the low end of generation and slopes downwards from there to zero at the highest level of generation). The curve shown is for 77 GW capacity in the system only from wind. The principles for meeting peak demand set out above are not even close to being met by this curve. The most likely value of generation is towards the low end of the generation and the cuves slopes down from there towards zero at high levels of generation. The system would struggle to reliably meet any demand. Therefore it is not possible to have a reliable electricity system entirely based on wind power. If 100% of wind power is not feasible, what is the appropriate amount to have? This question needs an answer for all types of generation. The appropriate proportion for each type needs to be estimated on the basis of reliable studies. The black curve hasd beed scaled up from data for 2.6 GW of installed capacity for UK wind farms for the whole calendar year 2012. It would be better to use data for the whole of the GB System at times of peak demand and to cover a range of years but such data is not yet available to us. While use of more comprehensive data would result in a different curve, such difference is likely to be marginal. It is not possible to viualise that a GB wind probability curve could have characteristics similar to the needed thermal generation curve. The probability density functions (pdf) for demand and typical generation shown on Figure 2 are ‘normal’ distributions. This common type of pdf is used for demand and conventional generation on the basis of experience with its use for assessing GB Security of Supply. The demand curve has a higher standard deviation than the generation curve causing it to have a lower maximum value and a fatter shape. This relationship between maximum value and standard deviation is due to the fact that the area under a pdf must be equal to 1.0. The median value of the curve represents the position at which the probability of having more than that value is the same as having less than that value i.e. the odds are even for meeting this demand. The median value of the black curve is about 18 GW. This means that the chances of meeting any demand (with only wind in the system) would be less than even. Displacing conventional generation with wind generation would pull the combined generation pdf to the left. That would increase the risk that demand would be greater than generation. Having a significant proportion of wind in such a system would cause the risk to Security of Supply to be unacceptable. The inescapable conclusion is that when it comes to Security of Supply, the contribution from wind power has to be largely ignored.